How to edit a pipe? 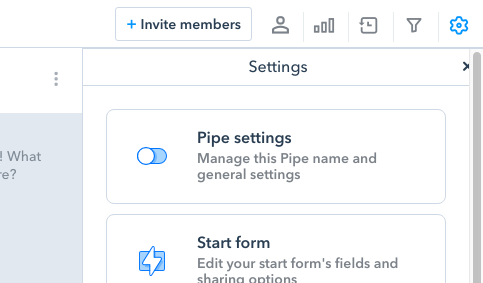 To access your Pipe’s Settings, open the Pipe you want to edit then click on the settings wheel on the upper right corner of your Pipe's dashboard. 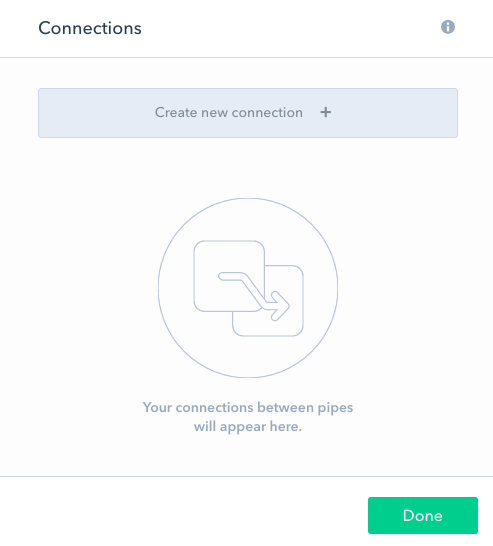 Your Pipe’s Settings will now pop up on the right side of your screen. Here’s what you find there - and remember, Pipefy is fully customizable to better adapt to your unique needs. Name of the Pipe - You can give your pipe a name here. Icon – Choose an icon that represents your pipe in order to easily recognize it. Title of the Card - You can set which of your fields you would like to appear as a title on your cards. Subtitles - Want to display more information on a card than just the title? Select which fields you would like to see as subtitles on your cards here. Summarized layout - Select which fields you want to be shown on your connected cards when you allow the Connections feature. Expired alert - You can set a maximum amount of time a card can spend in your pipe here - with an extra option to count weekdays only. 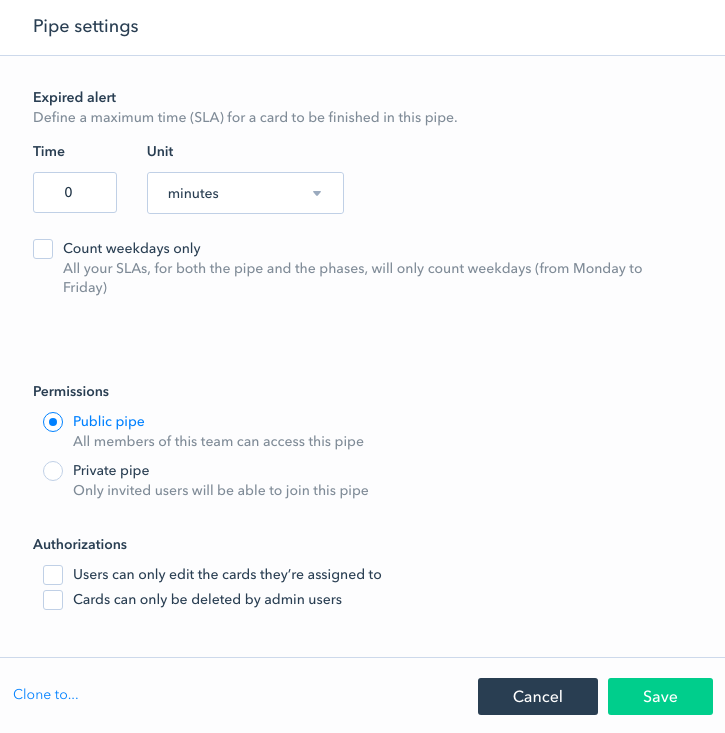 Permissions – You can determine if you want your Pipe to be Public (all members of your team can access and join the pipe) or Private (members can only join if they are invited to the Pipe by the Admin). Authorizations – You can choose if only Assignees and Admins are allowed to edit cards on the Pipe, or if only Admin users are allowed to delete cards on the pipe. These two options will give Admins more control over what happens inside of the Pipe. Delete Pipe - Click here if you want to delete this Pipe. Clone to - Click here and a list of teams to copy this pipe to will drop down. Note that only the phases and fields will be cloned, not the cards. Selecting this option will take you to your Start Form’s Settings. You can add and edit your start form’s fields here, change the text displayed on the 'Create new Cards button', change the title of your cards, enable your start form to be a Public Form and activate your Email Inbox. Also, you can check or uncheck the option to allow all team members to create cards on this Pipe. Setup action buttons - You can, for example, enable that cards can skip steps, or move directly to the ‘Done’-phase from a phase. 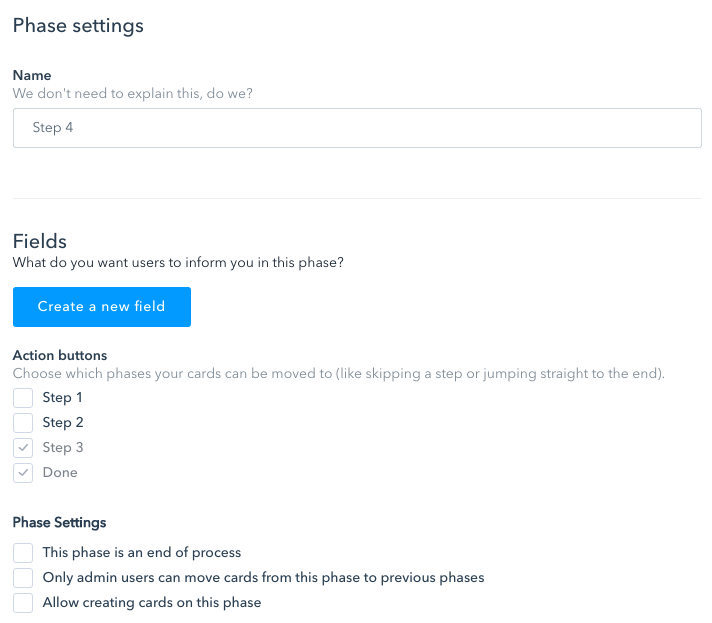 Phase settings - You can enable or disable if this phase is the end of a specific process, or you can make sure than no one but the Admin of a pipe can move cards back. This second option allows for more control and a smooth process flow. You can also allow a 'Create new card'-button on a specific phase. Auto-assign someone - All cards that enter this particular phase will be automatically assigned to someone. This way, you no longer have to manually assign cards to a specific person. Configure and create email templates - You can configure email templates related to this phase here. Add a description - You can add a phase description here. This description will be shown on your phase so that pipe members can very clearly see what this phase is for. Set a late alert - Configure when you will be notified that a card is staying too long in a particular phase. Admin - Can do everything within the Pipe as well as edit the Pipe’s settings. From within the ‘Members’-page, you can also invite new members to your pipe. Clicking 'Connections' allows you to enable creating connected cards from this pipe. Click create new connection to get started. Connected pipe - Select which pipe you want to connect to this pipe. All pipes available in your team will be displayed in the dropdown menu. Connection function - What should this connection do? 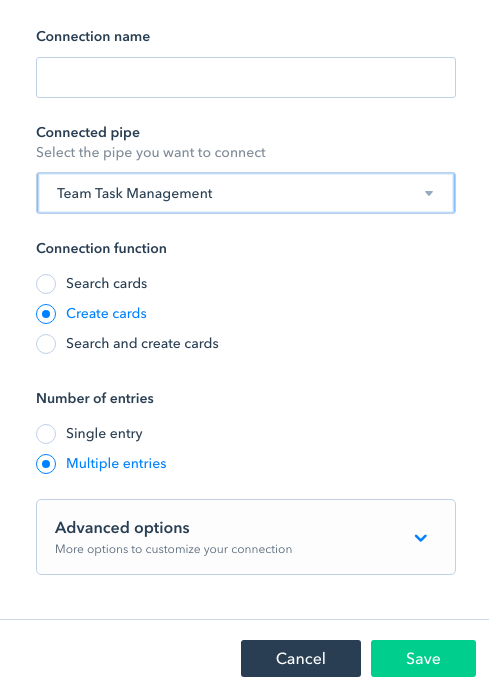 Create new cards on the connected pipe (create cards), link existing cards (search cards) or perform a combination of both (search and create cards). Number of entries - How many child cards can be created or linked to the parent card? Just one card or multiple cards? 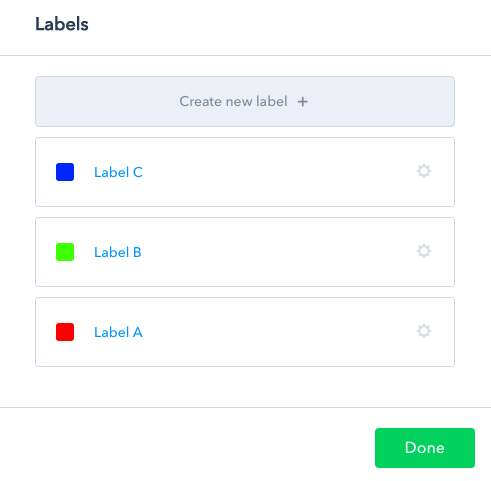 You can create and edit colored labels to better identify your different cards. As everything else on Pipefy, you can customize them as you wish. Click 'Create new label' or edit an existing one by clicking the little settings wheel on the right side of the label. 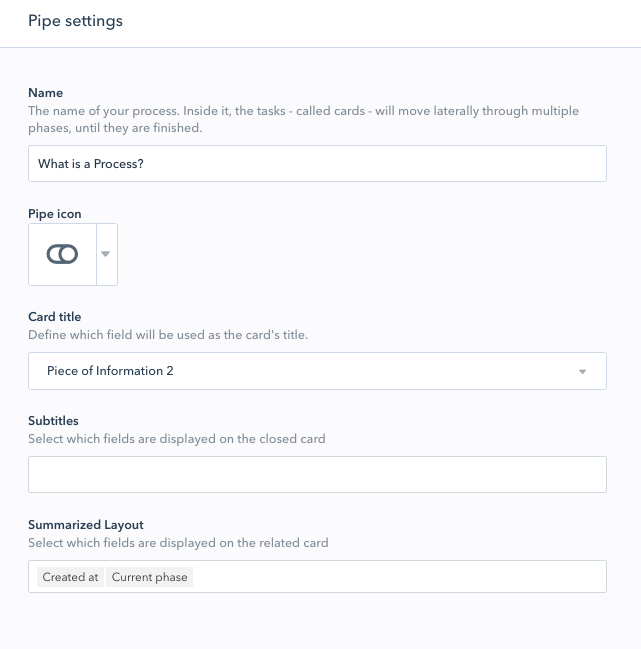 Pipefy allows you to create email templates to be sent manually or automatically from within your Pipe’s Phases. Learn more about creating and sending automated email messages in the third chapter (Advanced Features). If you open the 'Integrations'-tab, an overview of recommended Zaps will pop up. 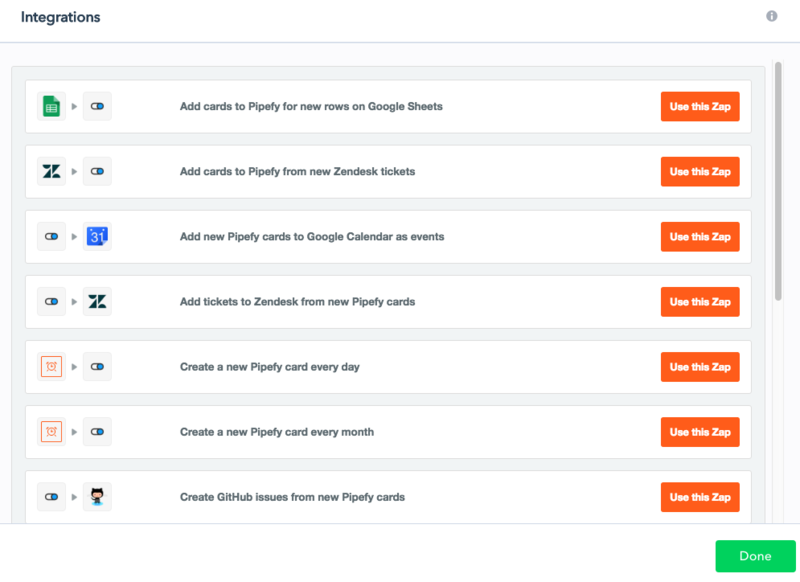 A Zap is an integration between Pipefy and another web application, made possible by Zapier. Learn more about integrating apps using Zapier in the third chapter of this Knowledge Base ('Advanced Features').